The BC Energy Step Code came into effect in 2018. The energy we use to heat, power, and cool our homes and buildings makes up over half of Victoria’s total greenhouse gas emissions. As part of the City’s commitment to climate action, Victoria is joining other local governments across the province with the adoption of the BC Energy Step Code. The BC Energy Step Code is an optional compliance path in the BC Building Code that local governments may use to incentivize or require a level of energy efficiency in new construction that goes above and beyond the requirements of the BC Building Code. When does the Step Code come into effect in Victoria? Victoria has adopted a phased approach to allow builders time to transition to the new Code requirements. From November 1, 2018 to December 31, 2019 new residential and commercial buildings will need to demonstrate compliance with Step 1 of the Step Code. Step 1 involves demonstrating that a new residential or commercial building will meet or exceed the minimum energy-efficiency requirements in the base BC Building Code by measuring airtightness and energy performance. Step 2 for Part 3 high-rise/concrete residential buildings and commercial buildings. The City will monitor how projects are doing in terms of achieving the performance requirements before adopting higher Steps of the code. What makes a Step Code building different from a conventional one? Currently, the majority of construction in Victoria pursues energy efficiency by having buildings meet specific requirements in the BC Building Code for insulation, windows, furnaces, water heaters, lighting and other equipment and systems. It focuses on individual elements, rather than ensuring the building functions well as a system. The result can be a building that does not perform as well as intended. 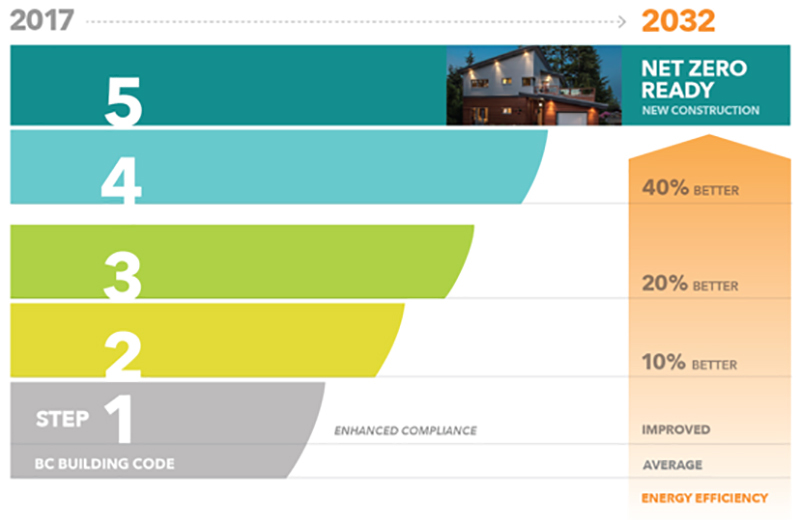 The BC Energy Step Code is a performance-based approach to energy efficiency. Builders have more flexibility to comply with the energy-efficiency provisions of the provincial legislation. The new standard empowers builders to pursue innovative, creative, cost-effective solutions—and allows them to incorporate leading-edge technologies as they come available. To comply with the BC Energy Step Code, builders will use energy software modelling and on-site testing to demonstrate that both their design and the constructed building meet the requirements of the standard. They may use any materials or construction methods to do so. This approach is similar to that taken by many green-building certification programs, including Natural Resources Canada’s Energy Star for New Homes and R-2000 programs, and Passive House certification, as well as the Canadian Home Building Association’s Net Zero Home and Net Zero Ready Home programs. Fortis BC also has a rebate program for new homes built to the Step Code. For multi-family, commercial and institutional buildings (Part 3 Buildings) there is a new incentive program called Better Buildings BC: The Net-Zero Energy-Ready Challenge. The program provides incentives to developers of buildings designed to achieve the top tier of the BC Energy Step Code. Those targeting the Passive House Institute’s Passive House standard are also eligible to apply. The Province will celebrate the successful applicants as leaders, and showcase the projects that ultimately emerge from the program as leading examples of innovative, energy-efficient designs. More information and applications are available at Efficiency BC. Note: Expressions of interest must be submitted no later than 11:59pm on November 30, 2018. For questions about the program, please contact Better Buildings BC. Why did the City adopt the Step Code? Health and Comfort - Studies have shown that high-performance homes are more comfortable and healthier, because they effectively manage temperature and fresh air throughout the building. Less Energy, Lower Bills - The Step Code improves energy efficiency and lowers energy bills compared to homes and buildings with similar systems designed under the BC Building Code. Climate Leadership – Buildings account for 50% of Victoria’s greenhouse gas emissions, and the Step Code aligns with the City and Province’s target of new construction becoming “net-zero energy ready” by 2032. For guidance related to Step Code energy modelling requirements, the City will be referencing the City of Vancouver's Energy Modelling Guidelines Version 1, March 2017. For information and resources on the BC Energy Step Code, including the implementation guide, costing study, technical webinars, and FAQs, visit www.energystepcode.ca. To provide your input regarding adoption of the Step Code and the best mechanisms to support industry in its implementation, contact us by email.